Over the last three years, I’ve said to many people that best friends are revealed when you’re at your worst, not your best--when you're at the bottom, not the top. When you’re at the top, it’s hard to know who your true friends are because you have so much to offer. But when you’re at the bottom and have nothing to offer but leprosy and liability to anyone who comes close, that’s when you take notice of who is there. Southern novelist Walker Percy wrote in Love in the Ruins, “We love those who know the worst about us and don’t turn their faces away.” Apart from my wife Stacie and my three kids, no one has personified Percy’s words toward me more than Paul Zahl. Paul and I got to know each other years ago after I reached out to him to express my appreciation for his excellent book Grace in Practice: A Theology of Everyday Life. At that time, my “career” was taking off, and Paul’s was slowing down. He had recently retired from a lifetime of faithful and fruitful service in the ministry as a pastor, theologian, Seminary President, scholar, counselor, and author. From his many prestigious posts, Paul’s unwavering commitment to brilliantly (and romantically) articulating the radicality of God’s one-way love, His grace, oftentimes got him into trouble with all of the right people. From the moment we met, I knew I had made a friend. Over the years he became a pastor to me, a counselor, a mentor, a sounding board, a real father figure. He took a keen interest in my work. But more importantly, he took a keen interest in me. He wholeheartedly believed the message that he had lived for (and, in many ways, died for) and it showed in his friendship to me. So it shouldn’t have been a surprise to me that when I self-destructed, Paul was one of the first people to “move in.” As many of you know, when you are living with a secret sin, and it finally gets exposed, you want to run and hide. You understand that everybody in your life will be rightfully angry and hurt because they’ve been betrayed and lied to in some way and therefore want nothing to do with you. So, I assumed Paul would feel that way too especially since he had invested so much time and energy into our relationship. And I’m sure he did—he had every right to. But as people were running away from me, Paul was running toward me. And he hasn’t left my side one time. I wish I could say that after my exposure, my running came to a screeching halt. But as is often the case when we get caught, things get way worse before they start to get better—our flight from God doesn’t stop, it oftentimes accelerates. For me, the embarrassing truth is that for a while afterwards, I selfishly (and frantically) wandered. I was lost, undone, confused, angry (at God, others, and myself), and doing everything I could to “rescue” myself from the wreckage I caused. I was in full self-salvation mode. I was withholding the truth from people (including Paul) and spinning “the story” as manipulatively as I could, frenetically trying to manage my image and minimize my own culpability. Everything I did to try and salvage what I could and fill the gaping voids created by my own sin, caused even more damage to myself and others. I was still on the run. I was still hiding. I was slipping deeper down—getting worse, not better. I was an emotional and functional wreck. And still, Paul stayed. He lived through my running and my rebellion. He lived through my deceit and my duplicity, my cover-ups and my “calculations.” He lived through my stubbornness and my secrets. The worse I got, the closer he came. Rather than backing away (which he would have been completely justified in doing because I was lying to HIM, running from HIM, taking advantage of HIM), Paul drew nearer. Like “the hound of heaven,” he chased me through my minefield of self-protection, stepping on every explosive I planted, enduring personal injuries along the way. And he never ever stopped moving—bloodied and burnt—in my direction. In speaking about fathers and their rebellious teenagers, Paul writes in Grace in Practice, “They are begging you to leave so that you will stay.” Although I may not have been intentionally testing Paul’s love for me (“begging him to leave so that he’d stay”), my behavior toward him at times certainly seemed like I was. Regardless, his love for me (someone who had nothing to offer but heartache and hurt) was proven by his refusal to give up on me. As days turned into weeks, and weeks turned into months, it was God’s one-way love for me through Paul that eventually softened my heart and stopped my running. It was Paul’s “long obedience in the same direction” (the obedience of love) that gave me a profound and tangible embodiment of God’s persistent love and patient kindness, both of which led me to a deeper awareness of my sin and of God’s grace. So many times I would wonder, “Why does he stick around? I’ve basically done everything possible to make him want to run away from me. What’s his angle? 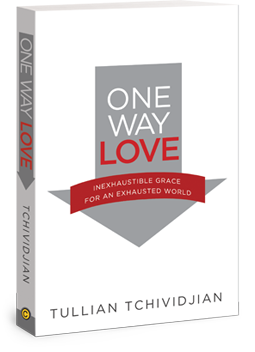 What’s his agenda?” But what God has taught me through Paul is that the only agenda unconditional love has IS to love—that the singular angle of one-way love is, well—one way. In a world where we are conditioned to believe that “I will give love to you as long as I am getting love from you,” unconditional love makes no intuitive sense. It is, in fact, completely counterintuitive. It is irrational. In this sense, I thank God for Paul’s sustained irrationality. He understands that “grace has no space for boundaries,” that self-protection (along with any desire for self-gain) and unconditional love cannot coexist. Every day I thank God that Paul genuinely believes the following words that he wrote ten years ago. If he didn’t, I’m quite sure that I would not be alive today. Grace is love that seeks you out when you have nothing to give in return. Grace is love coming at you that has nothing to do with you. Grace is being loved when you are unlovable. It is being loved when you are the opposite of loveable…Grace is a love that has nothing to do with you, the beloved. It has everything to do with the lover…It has nothing to do with my intrinsic qualities or so-called “gifts.” It reflects a decision on the part of the giver, the one who loves, in relation to the receiver, the one who is loved, that negates any qualifications the receiver may personally hold. At a time when there are a growing number of preachers and writers expounding on the grace of God, Paul Zahl stands out among them all (me included) because he actually practices what he preaches. If it’s true that what one truly believes about grace is revealed in how one responds to the person who needs it the most and deserves it the least, then Paul is a true believer. Paul Zahl, a man amongst men, not only articulates the message of God’s grace but embodies it. He showed me the way that Jesus loves by loving me the way he did (and still does). Thank you, Paul, for being a “Never Gonna Give You Up” kind of friend (Rick Astley, 1987). Thank you for believing in one-way love. Thank you for going “to the gates” with me seventy times seven (Matthew 18:21-22). You are living proof to me that it is the “kindness of God that leads to repentance” (Romans 2:4). I love you because you have seen and experienced the worst of me and never turned your face away.